For nearly sixty years, several Beduin families of the Hazlin-Jahalin tribe have been living in Umm al Kheir, near Carmel colony (Jewish settlement). These are refugees of the 1948 war, originally from the vicinity of Arad. Over twenty-five years ago, the Carmel colony was built adjacent to the farming plots of some of the Hazalin families. 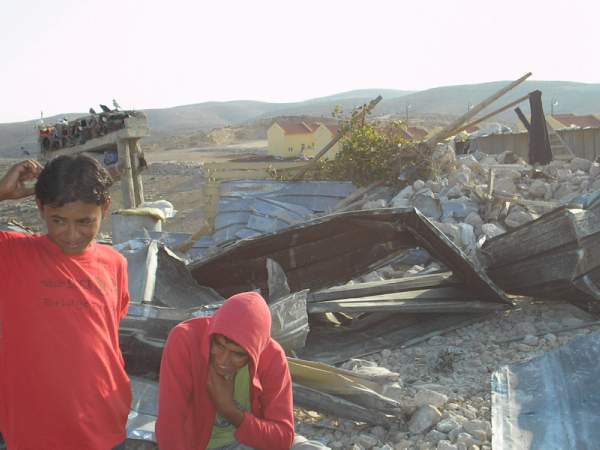 Ever since, the Occupation authorities have prevented the families – who found themselves living right next to the colony – from building or permanently developing any further necessary structures beyond the meager housing they already had. Over the years, a considerable part of these families’ privately-owned land was confiscated in favor of the colony, and demolition of both houses and temporary dwellings takes place on a regular basis. Previously, the last demolition took place in February 2007. Now, on Wednesday October 29th, 2008, another massive demolition of homes was carried out. The greatest damage was done to the families located in the southern cluster, next to the new expansion of Carmel colony. Here four shacks were demolished as well as two stone houses of Hajj Salam Hazalin, that had served as dwelling for twenty-four persons. In the heat of its action, the bulldozer also demolished an old stone house dating back to the Jordanian rule of the area, a house for which no demolition order had been issued. Another house demolished nearby is that of Suleiman and Maliha Hazalin which was home to ten persons. Apparently this demolition action focused on the dwellings closest to Carmel’s new neighborhood whose residents, recently moved in, complain of noise and messiness on the part of the Beduins (a-la ‘not in my back yard’). 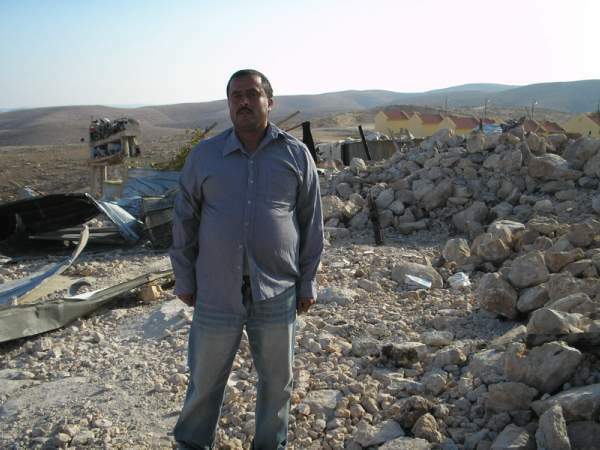 Beside the massive demolition in teh southern cluster, demolition on a smaller scale has also taken place in the northern cluster of the Hazalin families next to Carmel’s fence. 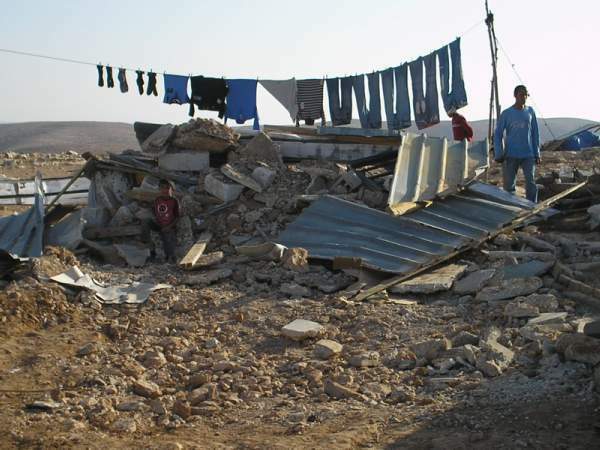 Here the tin shack of Salam Mohammad was demolished, that had housed ten persons, as well as his brother Ali’s new stone house where he resided with his wife and baby-daughter. The demolition operation took place in the morning, in the presence of heavy army and police forces, while the only residents present were the elderly, women and small children. The older children were at school, a few hundred meters away. Sagher, Salam Mohammad’s nine-year-old son, told us that as he came out of the school house for a moment, he looked over to his home and went back in to report to his teacher that sicne his home had disappeared suddenly, (the tin shack that was demolished), he needed to get back to his home immediately. We arrived at Umm al Kheir only that afternoon. We brought with us two tents which we had purchased at a discount (courtesy of the shop owner) in the Beduin town of Rahat near our residence. Earlier still, Red Cross staff arrived and provided the residents who had remained homeless in the early winter rains and cold, tents, mattresses, cooking gas tanks, etc. Extensive damage was dealt to the meager belongings of the residents, and they need urgent material and financial help. Furthermore, legal aid is needed for – among other things – filing a damages charge following the unlawful demolition of the above-mentioned stone building. In these matters, please contact the undersigned at ksehud@gmail.com .